Entry Requirements: Learners must be at least 18 years old. There are no formal entry requirements for this qualification. However, learners must have knowledge of electrical installation and electrical science. This award gives the learner an understanding of the IET Wiring Regulations, 18th Edition, which is the successor to 17th Edition.. It provides a facility for individuals working in the electrotechnical sector to develop and/or enhance their knowledge of the Requirements for Electrical Installations. 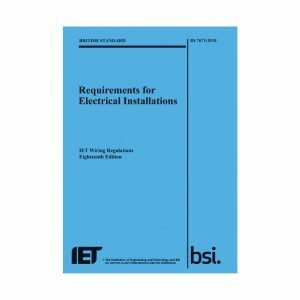 The qualification covers the full content of BS7671:2018 IET Wiring Regulations, 18th Edition. The regulations apply to the design, erection and verifications of electrical installations including additions and alterations to existing installations. All electrical personnel with a responsibility for the safe installation of electrical apparatus operating up to 1000V AC in industrial/commercial and domestic premises. To familiarise participants with the layout, content and application of the IET 18th Edition Wiring regulations. This course entails an EAL on-screen examination. The online multiple choice examination comprises of 60 questions (120 minutes) and is open book. Delegates are permitted the use of BS 7671 only, the IET On-Site Guide and any other materials are not permitted. Delegates who successfully complete the course and the EAL examinations will receive an EAL accredited certificate. Delegates who fail or do not wish to undertake EAL examinations will receive a NarecDE attendance certificate. Course & EAL Examinations: £425.00 + VAT per person.